Stonehenge is not to be missed, but the megalithic circle at Avebury and the many surrounding ancient structures are far more interesting. It's easy to spend an entire day there exploring the many sites. 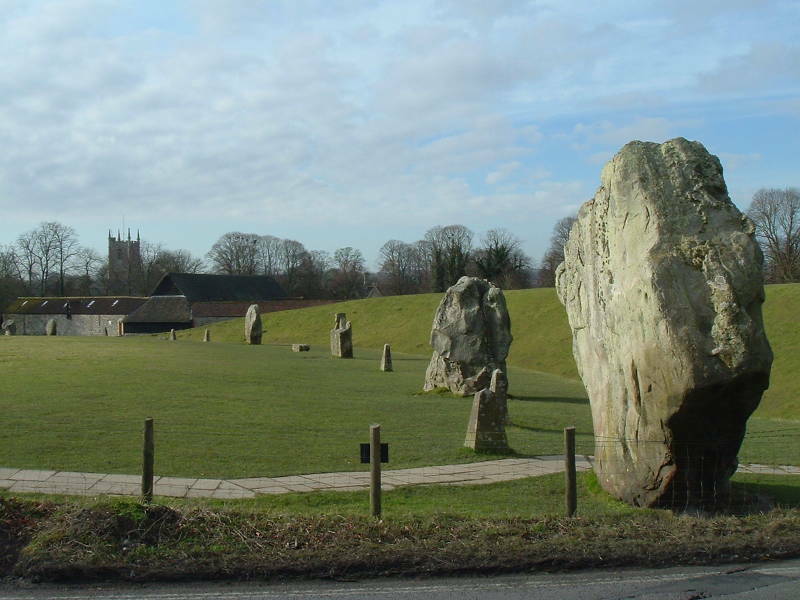 Avebury is a complex of several megalithic structures of widely varying design, built over a period of many centuries. Avebury is one of the finest and largest Neolithic monument sites in Europe and dates back to around 3,000 BC. 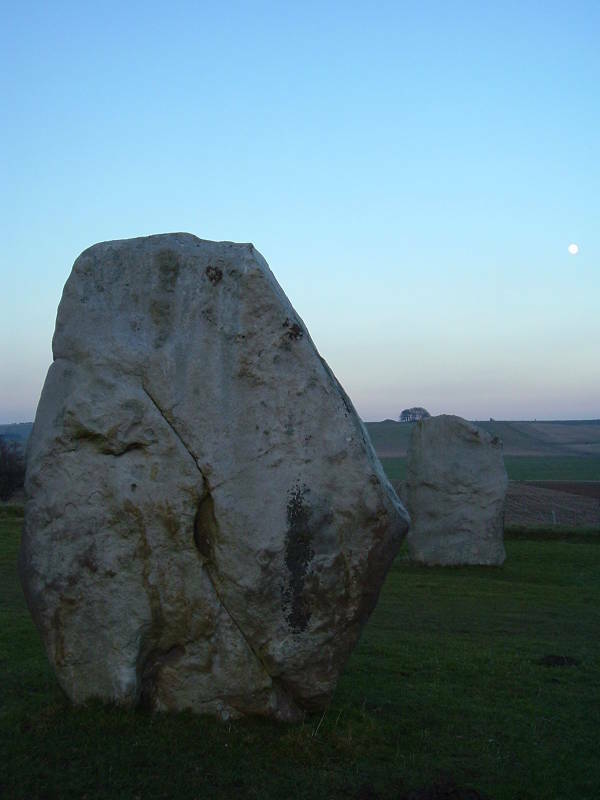 Avebury is older than the megalithic stages of Stonehenge, although some of the purely turf components of that complex go back to a similar age. 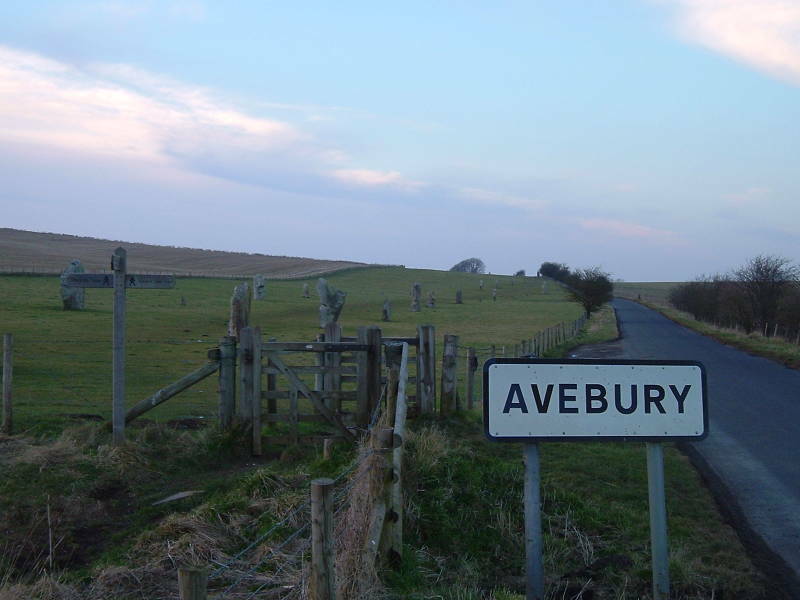 The village of Avebury is approximately midway between the larger towns of Marlborough and Calne, just off the main A4 road on the northbound A4361 towards Wroughton. It is about 32 kilometers north of Stonehenge. 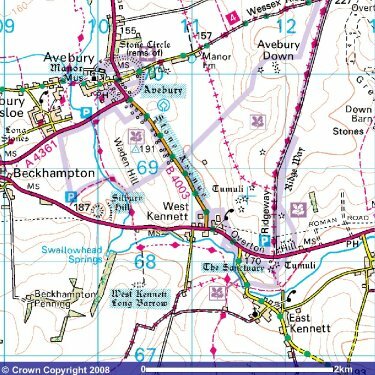 You will probably want to buy the 1:25,000 Marlborough Ordnance Survey map. 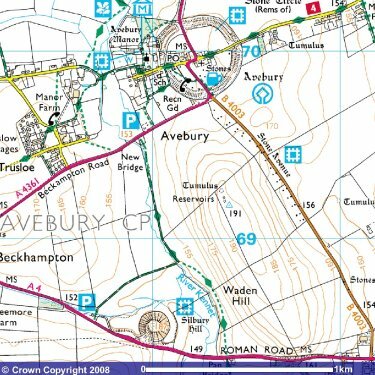 The first map below (1:250,000 scale) shows Avebury's location with respect to other small villages in the area. The second map below (1:50,000 scale) shows Avebury village and some of the ancient monuments. The two maps below (1:25,000 scale) show the village and the prehistoric monuments in more detail. The public rights of way shown as green here are a fantastic feature of the U.K. — the public is guaranteed access to these footpaths! 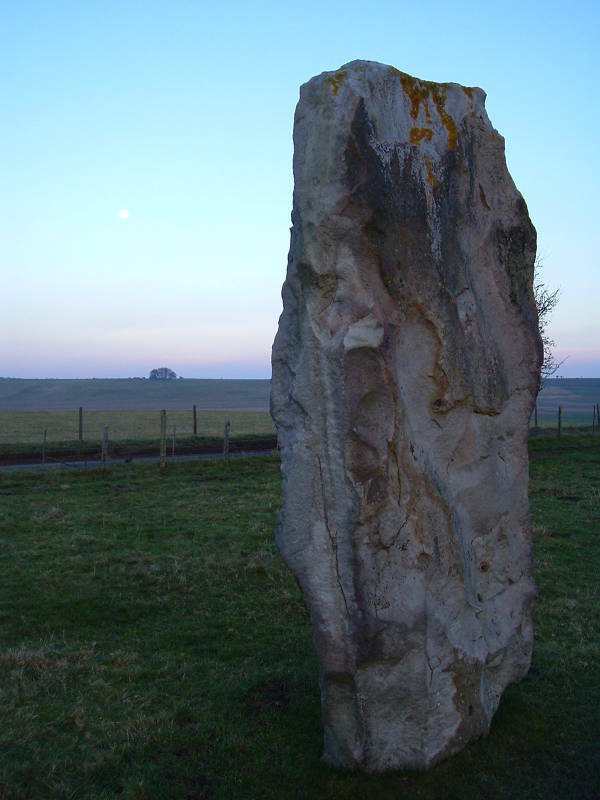 As for logistics, Avebury is a small village. The only accommodations available are B&B at the Red Lion pub at the crossroads almost at the center of the henge. It's relatively expensive. 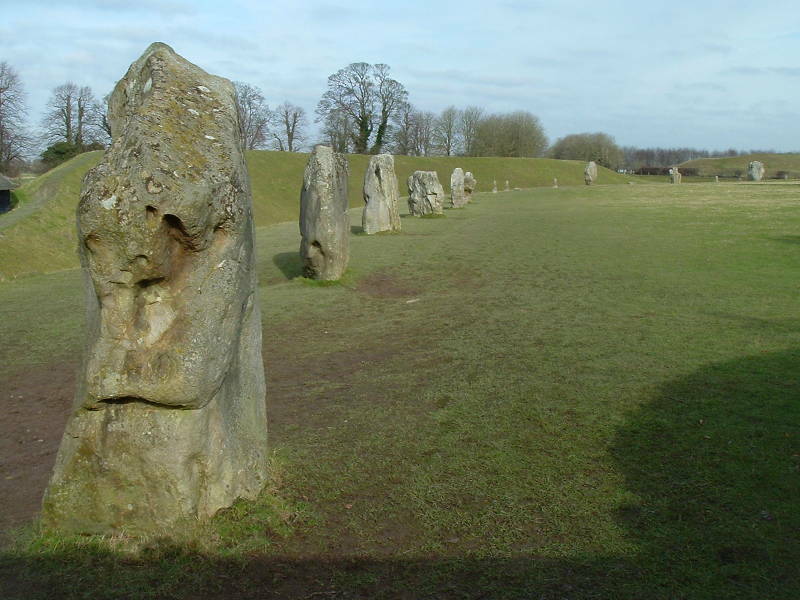 I have visited Avebury as a day trip while staying at the Bath Backpackers hostel in Bath. Start by taking a bus to Devizes, and then buses run at least hourly between Devizes and Avebury. But be very careful with the bus schedules, the last bus back to Devizes may leave Avebury around 1900! Click here for Wiltshire bus routes and timetables. The Red Lion is the place for food and drink in Avebury! 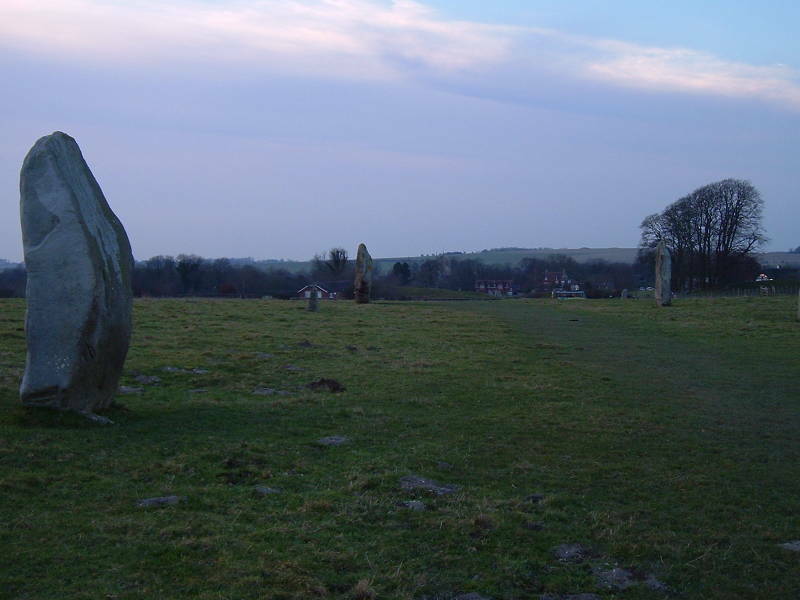 The small village of Avebury was built within the protective earth banks around the stone circle. Now some small roads go through the circle. The central monument is a large circular earthworks — a circular inner ditch and external henge, or circular bank, just over 420 meters in diameter. 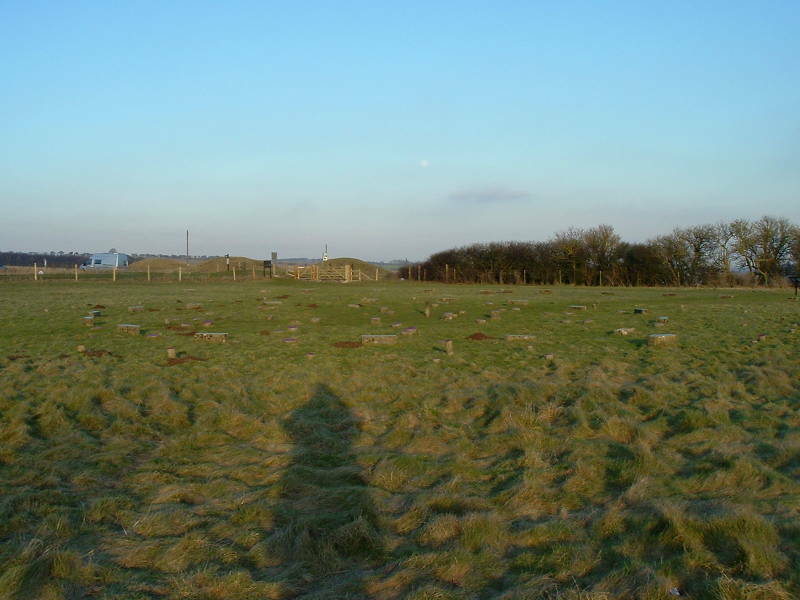 Within the henge is the Outer Circle, the world's largest prehistoric stone circle with a diameter of 335 meters. Here you see a view from the top of the henge along the south-east side, looking down across the ditch and toward Avebury Manor just outside the west side of the henge. The A4361 road cuts south to north through the henge. 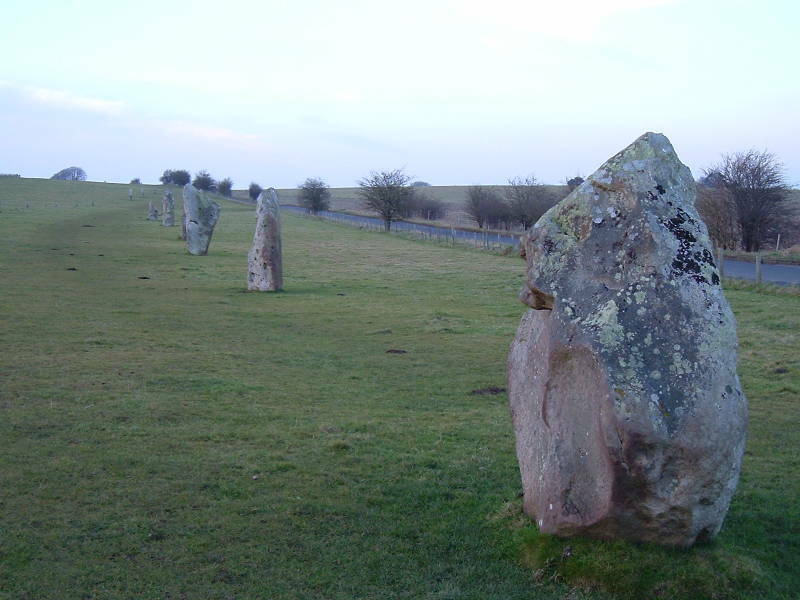 The Outer Circle was originally made up of 98 sarsen standing stones, varying in height from 3.6 to 4.2 meters and some weighing over 40 tons. Carbon dates from the fill below them date to 2,800-2,400 BC. Here you are looking across the northern edge of the Outer Circle toward the Church of England village church in the distance. It has an 11th century Saxon nave, and two original Saxon windows survive. It's dedication was described as "All Saints" in the 13th century, but it now is dedicated to Saint James. Within the Outer Circle were two separate stone circles of about 100 meter diameter. Only two standing stones remain of the Northern Inner Ring, and the Southern Inner Ring is entirely destroyed. The Northern Inner Ring was 98 meters in diameter. It had a cove of three standing stones at its center, with its entrance facing to the northeast. The Southern Inner Ring was 108 meters in diameter. It had one large central monolith, 5.5 meters high, with an alignment of smaller stones. Some archaeologists believe that parts of the monument were designed for acoustic effect, with sounds produced in the Inner Rings creating special echoes. 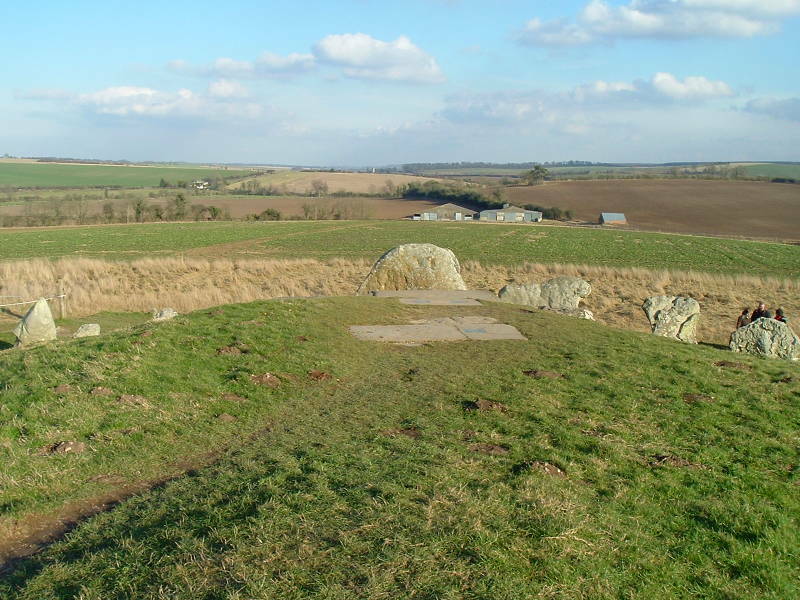 Here you are standing on top of the henge on its south-east side looking to the north-east. 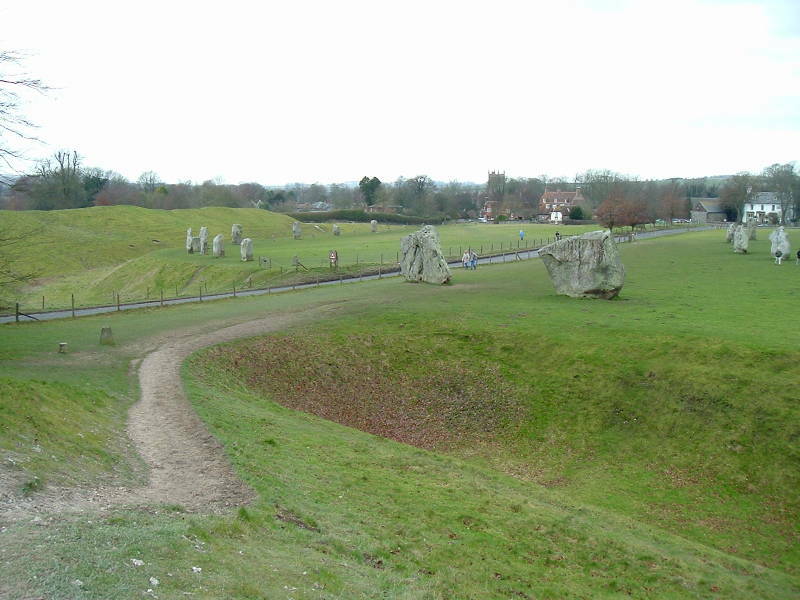 Traveling from outside to in (right to left in this picture), you would first go up the steep outer slope of the henge, up to 10 meters above average ground level. Then you would descend the henge and continue further down into a ditch, down to maybe 5 meters below average ground level. With the ditch on the inside rather than the outside, this clearly is not a defensive structure, or at least not a very well-designed one. Inside the ditch is the Outer Circle of monoliths. 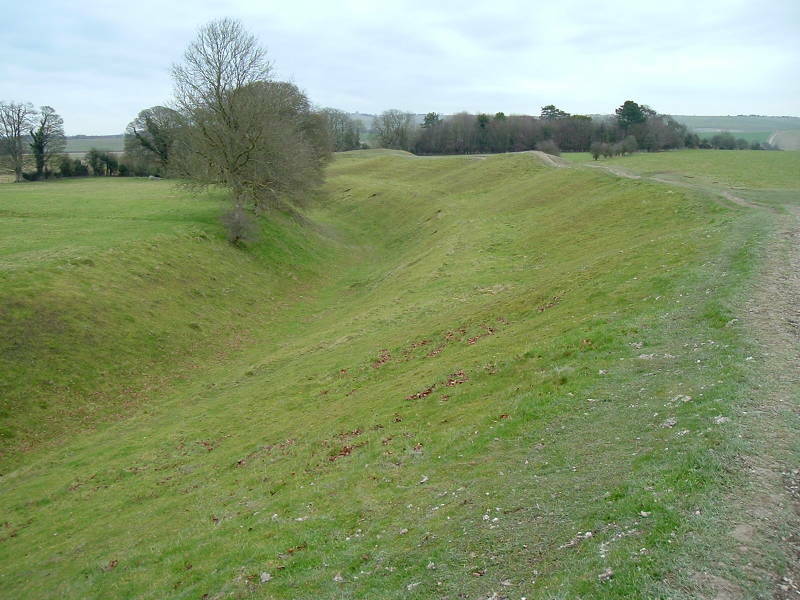 The ditch itself is a large project, 21 meters wide and 11 meters deep carved into the chalk. Intermittent excavations from 1908 through 1922 by Harold St George Gray showed the red deer antlers had been the primary digging tools. The two large standing stones flanking the Southern Entrance had unusual smooth surfaces. This is probably because stone axes were ritually polished on their faces. 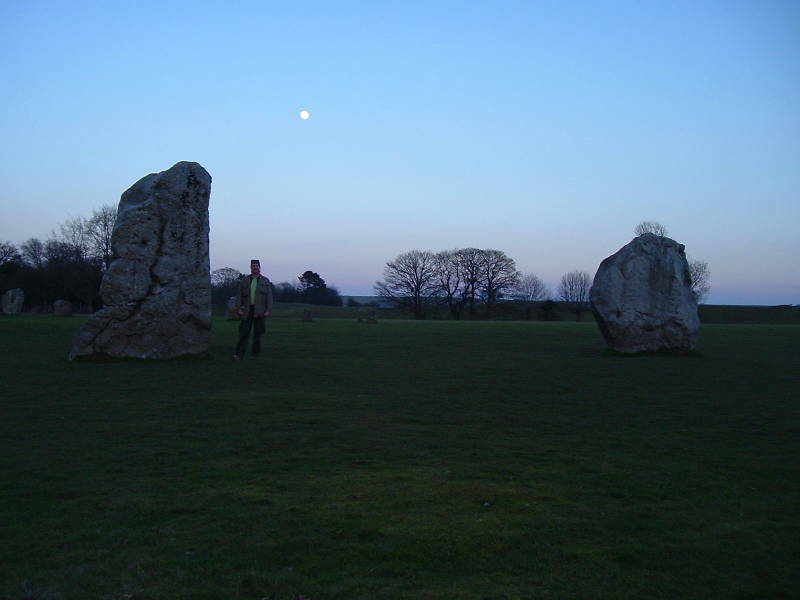 Here I am in the main stone circle as the full moon rises! The local people destroyed many of the standing stones in the Late Medieval and Early Modern periods, for a mixture of religious and practical reasons. Some of this was done to obtain stones for construction, but much was simply destruction for religious purposes. England had been converted to Christianity, and Avebury's obvious non-Christian origin caused it to be associated with the Devil. The largest stone at the southern entrance to the henge was called the Devil's Chair, a set of three close stones was called the Devil's Quoits, and the stones in the smaller Northern Inner Ring within the main circle were called the Devil's Brand-Irons. In 1835 the Penny Cyclopædia of The Society for the Diffussion of Useful Knowledge had an article about Avebury, showing that the circles were more complete than they are today. The local people began digging pits beside the large standing stones, then pulling the stones down and burying them in the pits. This apparently began in the 14th century at the urging of the local priest, probably either Thomas Mayn (served 1298-1319) or John de Hoby (1319-1324). It appears that a travelling barber-surgeon was passing through some time soon after 1325. He was carrying a leather pouch with three silver coins dated to around 1320-1325, a pair of iron scissors and a lance. The locals were preparing to pull down one of the stones, one standing 3 meters tall and weighing 13 tons. The travelling barber-surgeon either got too involved or was just standing too close — the stone fell on him as he was standing in the burial pit, fracturing his pelvis and breaking his neck while trapping his body under the 13-ton stone. The locals did not have the technology to lift the stone and give him a proper Christian burial. Or at least not a standardized one. But he certainly got buried in the middle of what they saw as a Christian activity. That seems to have been the end of the stone-toppling, maybe because the locals saw this as retribution from a vengeful spirit or maybe even the Devil himself. It sure seems that it would have been one of the locals crushed, rather than a travelling barber-surgeon who just happened to be passing through that day, but they stopped anyway. Then the Black Death arrived in 1349, decimating the population and giving the survivors more pressing requirements for their limited time and man power. The barber-crushing episode made enough of an impression that not only did they stop, but records from the 18th and 19th centuries show that there were still local legends about a man being crushed by a falling stone. Archaeologists found him in 1938. They named the stone the "Barber Stone" and stood it back up. The destruction returned and reached its peak in the later 17th and 18th centuries, influenced by the rise of Puritanism. The majority of the standing stones in the monument were smashed to be used as building material. 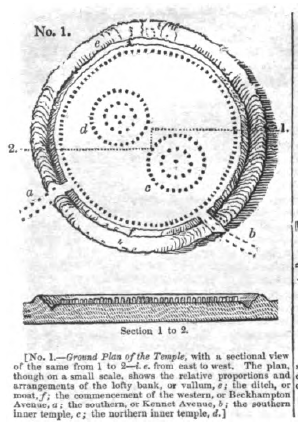 In 1835 the Penny Cyclopædia of The Society for the Diffussion of Useful Knowledge showed Avebury's circles as more complete than they are today. The Stone Age, named for the best technology of its time, before bronze and even longer before iron was developed, is divided into periods: Paleolithic or Old Stone Age; Mesoolithic or Middle Stone Age; and Neolithic or New Stone Age. The definitions of those periods depends on the region. You ask the question: when were humans occupying that territory and using that level of technology? For Britain, the Mesolithic period is applied to that time from about 9,600 to 5,800 years BC. Britain was not an island, as a landmass called Doggerland connected Britain to continental Europe. This was a large area stretching from today's British east coast to today's western coasts of Denmark, Germany and the Netherlands. Enough of Doggerland was submerged by about 6,500 BC to cut off what had been the British peninsula to form the island of Britain, although the Dogger Bank, an upland area, probably remained as an island until at least 5,000 BC. Neolithic spear points, a Neanderthal skull fragment more than 40,000 years old, and other Neolithic objects have been dredged from today's North Sea floor. The Mesolithic inhabitants of Britain were hunter-gatherers, moving around a heavily forested landscape in small family or tribal groups. Some Mesolithic flint tools dated to 7,000—4,000 BC have been found in the area around Avebury. Society in Britain underwent radical changes in the 4th millennium BC, bringing about the transition to a Neolithic culture. The huge change was caused by the development of agriculture, either as the arrival of the concept from its origins to the southeast, possibly in today's Turkey, or its independent local invention. The formerly nomadic hunter-gatherer people could settle down and produce their own food in place. Domesticated species of animals and plants were introduced, and new technology such as pottery was introduced or developed. The people cleared land to increase their agricultural activity. This control of the landscape led to the erection of monuments. Between about 3,500 and 3,300 BC the prehistoric Britons had reached the limit of their expansion for a while, and concentrated on further developing the best agricultural areas. It appears that their religious beliefs and practices changed around that same time. They had been building large chambered tombs, apparently for ancestor veneration. In the 3,500—3,300 BC time frame they began building large circular structures, initially mainly of wood and then from stone. The people who built Avebury clearly had a stable and secure agrarian society, in order to expend so many resources in its construction. 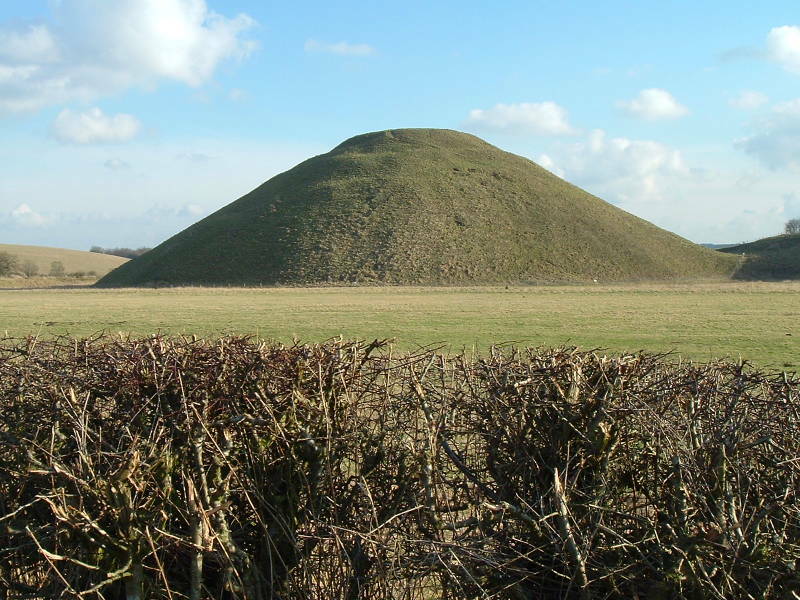 Silbury Hill is about 40 meters tall and was built in stages starting around 2,400 BC. It is made mostly from chalk and clay excavated from the surrounding area. Silbury Hill is the largest prehistoric man-made earthen mound in Europe and one of the largest in the world, and it was the largest man-made structure in Europe until the Middle Ages! 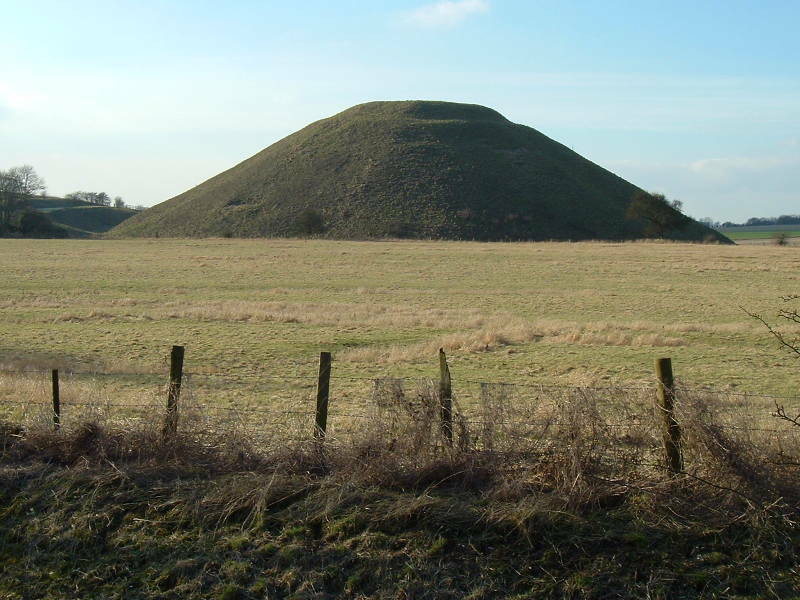 Archaeologists have calculated that Silbury Hill took 18 million man-hours, or 500 men working 15 years to deposit and shape 248,000 cubic metres of earth and fill. One author says a project of this scope could not be carried out under the Neolithic tribal structure we usually assume was the rule in this time. Instead, there must have been some authoritarian power elite, probably theocratic, with control or at least influence over a broad region. 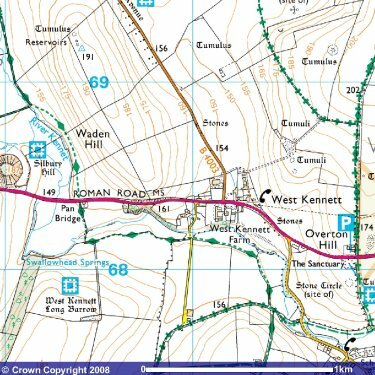 If you're using GPS, this is at UK grid reference SU 100 685 or 51°24'56" N 1°51'27" W.
See my page on the National Grid system and OS maps for details on how that works. The base of the hill is circular and 167 meters in diameter. The summit is flat-topped and 30 meters in diameter. 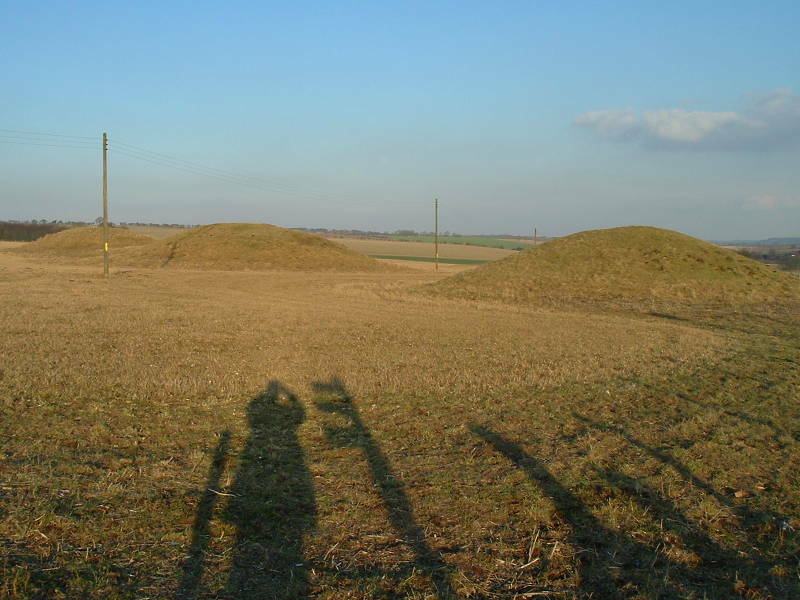 A smaller mound was constructed first and much enlarged in a later phase. Recent surveys have shown that the center of the flat top lies within one meter of the center of the outer cone of the hill. The first phase, carbon-dated to 2,400 BC, consisted of a gravel core within a revetment of stakes and sarsen boulders. Alternating layers of chalk rubble and earth were placed on top of initial core. The second phase involved excavation of an encircling ditch and using the resulting chalk material to extend the core. The ditch was later backfilled, and the mound was extended to its present dimensions using material from elsewhere. Here you see Silbury Hill from the top of the West Kennet Long Barrow. The village of Avebury is hidden behind the hill to the right. So what was its point? It's huge, but its shape is very simple and doesn't really suggest much. Of course that hasn't stopped people from coming up with all sorts of fanciful ideas! 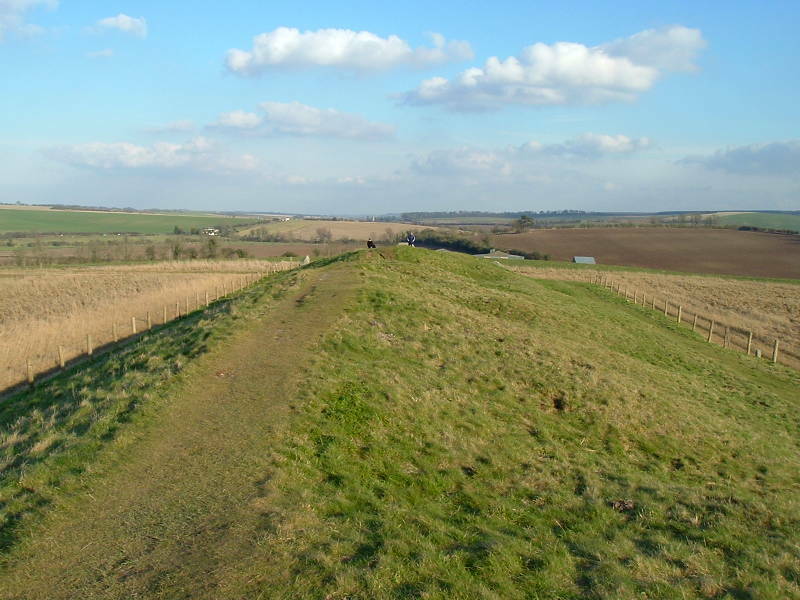 The explanation that seems the most plausible, or at least the most possible to support, is that Silbury Hill and some of the surrounding monuments were designed with a system of inter-related sightlines. 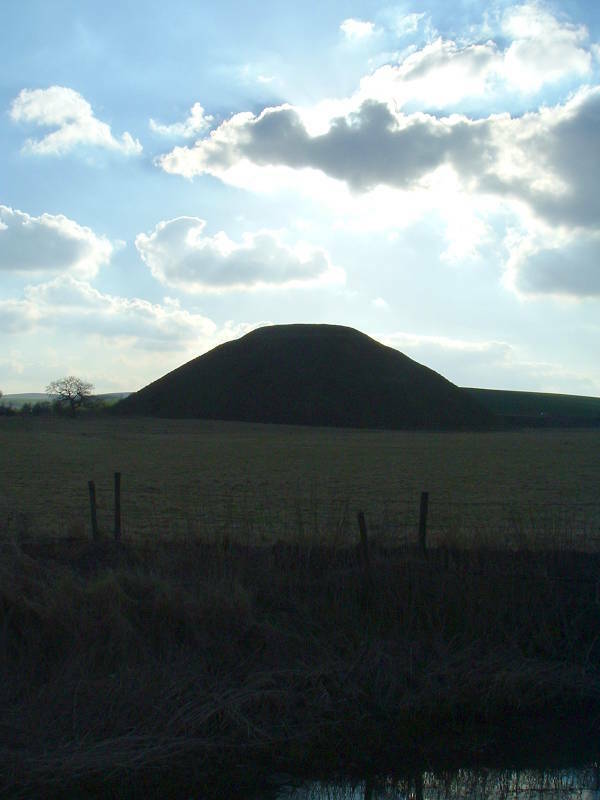 From Avebury and various surrounding barrows, a subtle step several meters below its summit aligns with hills on the horizon behind it or with hills in front of it. 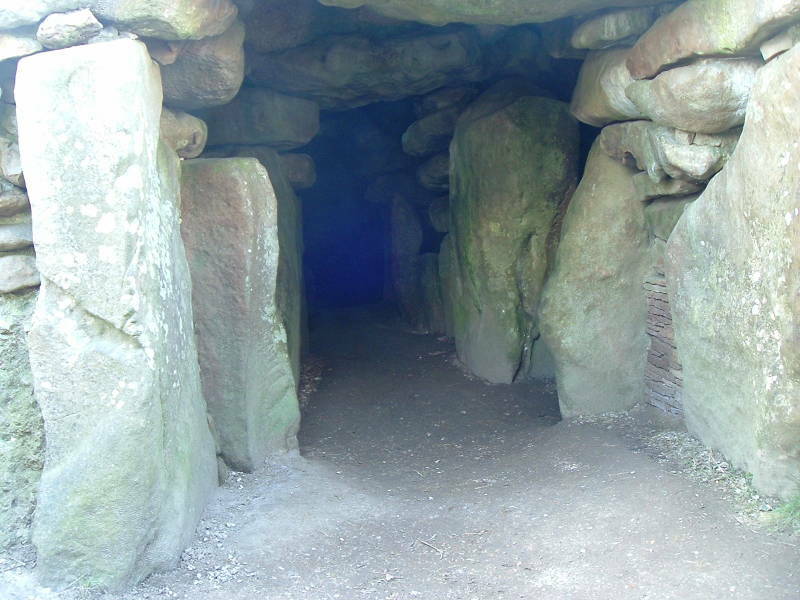 The West Kennet Long Barrow is a burial mound for about 50 individuals, dating from around 3,600 BC. 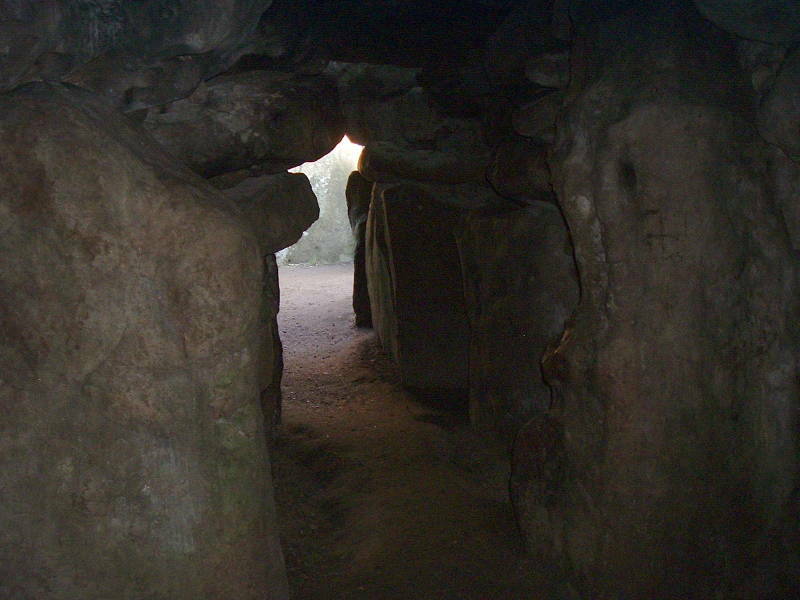 It is classified by archaeologists as a chambered long barrow or Neolithic tomb structure. It has two pairs of opposing transept chambers and a single terminal chamber, all used for burial. It's about 104 meters long by 23 meters at its widest. 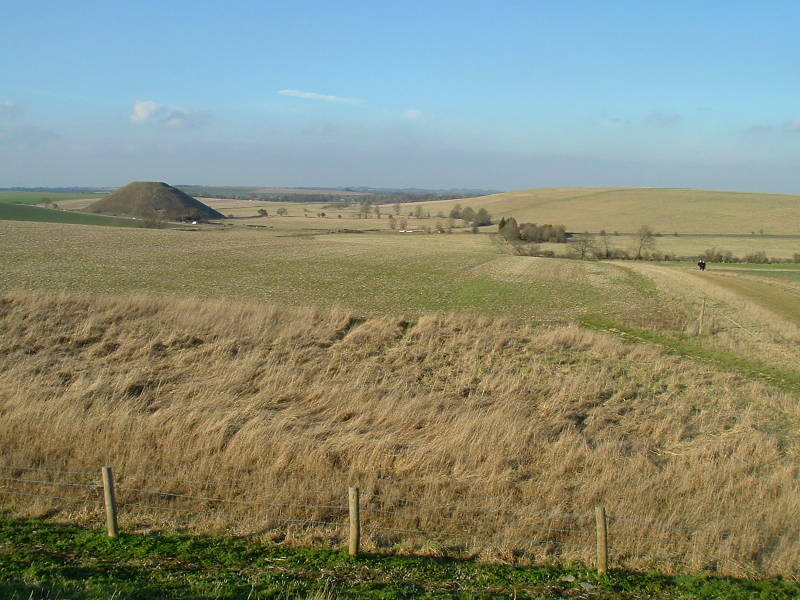 The four people at the left of this picture are standing on top of it looking toward Silbury Hill. 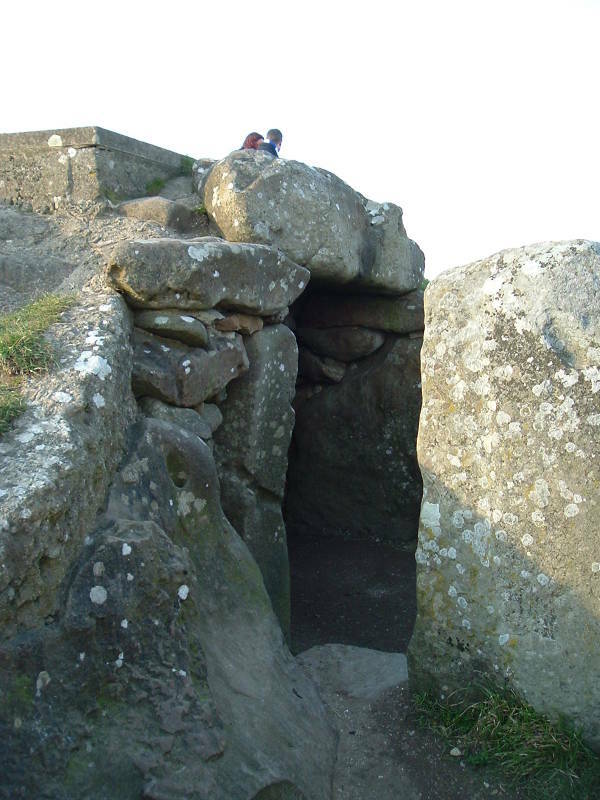 The entrance is at one end, between the megaliths at the right. If you're using GPS, this is at UK grid reference SU 104 677. 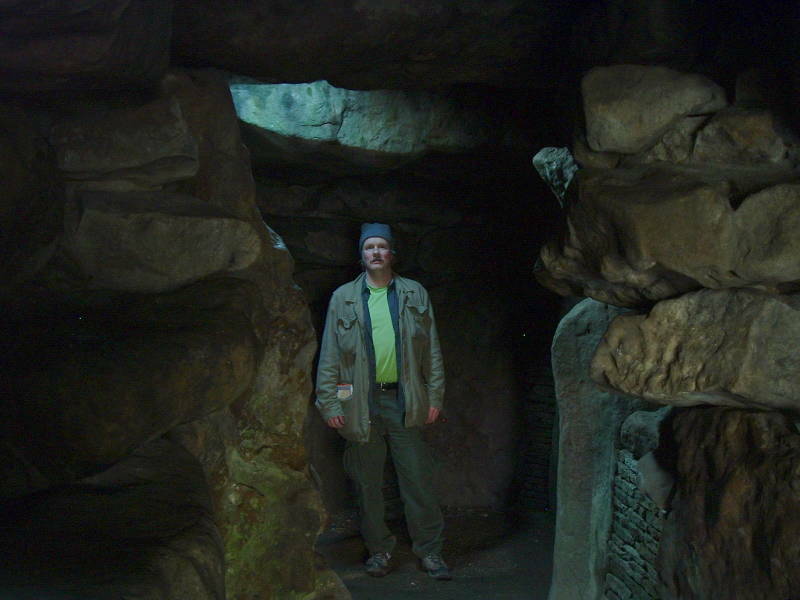 Here you are looking directly toward its entrance and the large sarsen slabs used to seal entry. Construction began about 3,600 BC, some 400 years before Stonehenge, and it was used until around 2,500 BC. The structure is 100 meters long. It has been estimated that about 15,700 man-hours were required for its construction. Excavations allow you to enter behind those sarsen slabs. Excavations have found burials of at least 46 individuals ranging from infants to the elderly. The skeletons were disarticulated with some skulls and long bones missing. It has been suggested that the bones were removed periodically for display or transported elsewhere with the blocking sarsens being removed and replaced each time. It is covered by turf now, but when it use it would have had bare chalk sides and stood out prominently. Here is the view looking in from the entrance. A narrow passage leads back to a larger chamber, with two transept chambers the terminal chamber forming a "T" or cross shape. 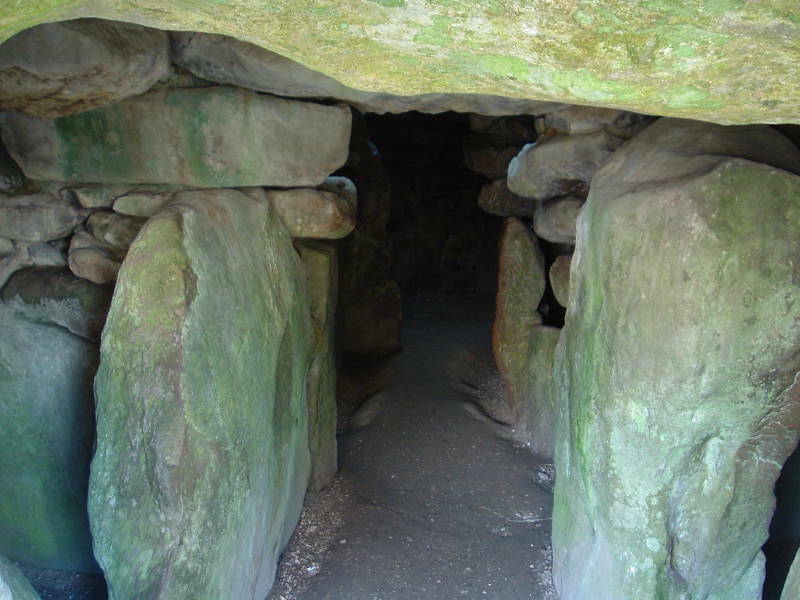 After use for around 1,000 years the chambers and passage were filled with a variety of grave goods and earth and stone. One archaeologist suggested that the grave goods had been collected from a nearby "mortuary temple", indicating that this site was used for ritual activity long after it was used for burial. In the first picture, I am in the main chamber. A recently installed small heavy glass skylight provides a little illumination. This is the view back toward the entrance from the main chamber. This is the view from the top of the burial mound, looking roughly east in the direction of the opening. And here, a view in the opposite direction, looking roughly west. 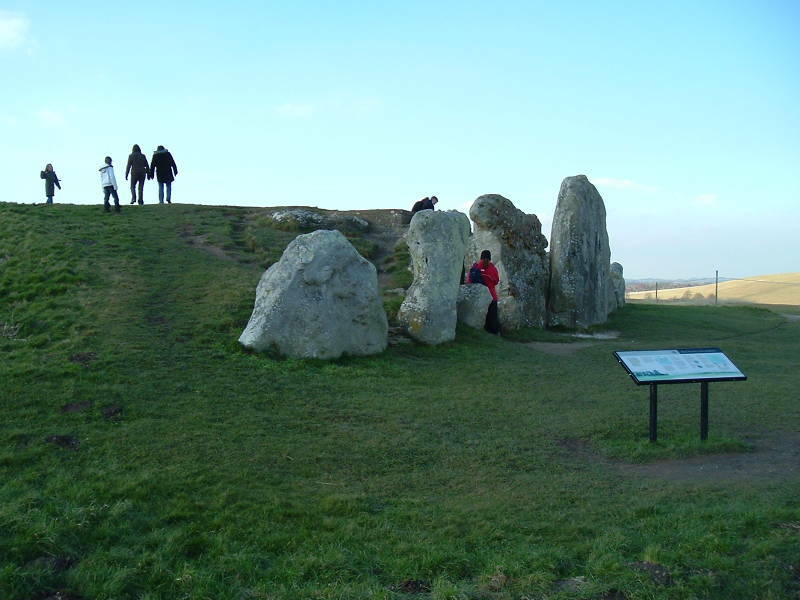 The West Kennet Long Barrow is located on a prominent chalk ridge a mile and a half south of Avebury, with Silbury Hill in between. The Sanctuary is a stone circle site on Overton Hill around UK grid reference SU 1180 6805. It started as six concentric rings of timbers erected around 3,000 BC. A series of three increasingly larger timber structures were built, and then replaced around 2,100 BC with two concentric stone circles. 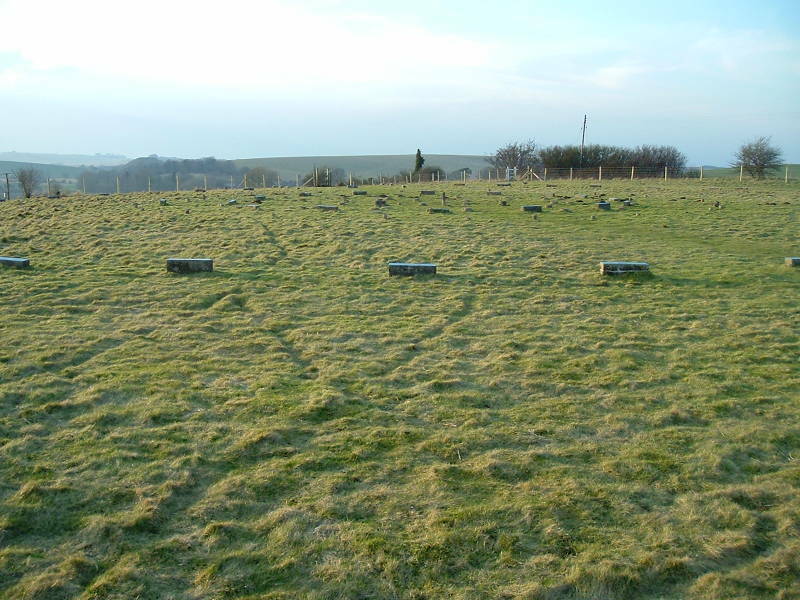 The site was largely destroyed in 1723, and today you mainly see short concrete posts marking the positions of the stones and timbers. The timber posts may have supported a roof covered in thatch or turf. The resulting structure could have been a high-status dwelling associated with the nearby ritual site of Avebury. 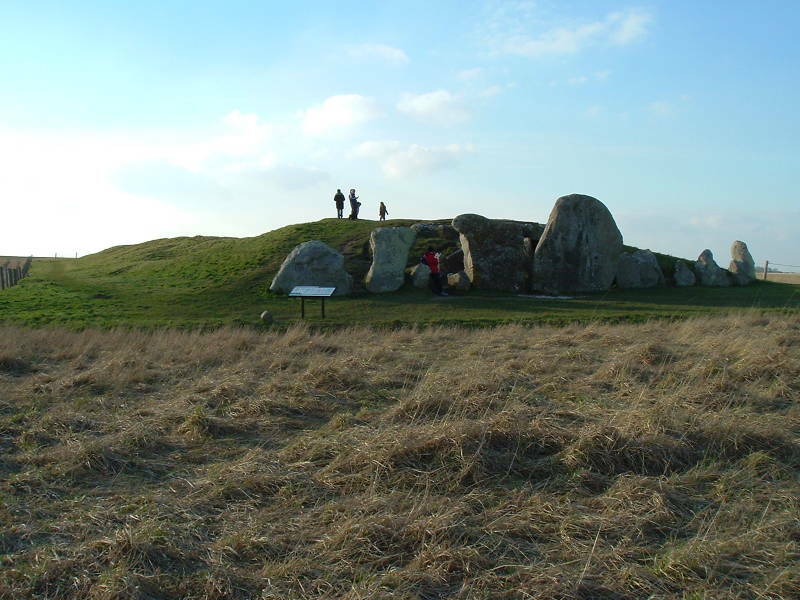 Another possibility is that it was a mortuary where corpses were kept before or after ritual treatment at Avebury. The stones may have been erected after the timber posts and any associated building were removed. Or, the stones may have been erected within the remaining wooden post array. Here you see the markers of the original timber posts and stones. In the distance are two tumuli, seen below. These tumuli are just across the busy A4 highway from the Santuary, near SU 1195 6815. The A4 highway was built on a Roman road. When the Romans built their road, it went past these monuments which were already over 1,000 years old. 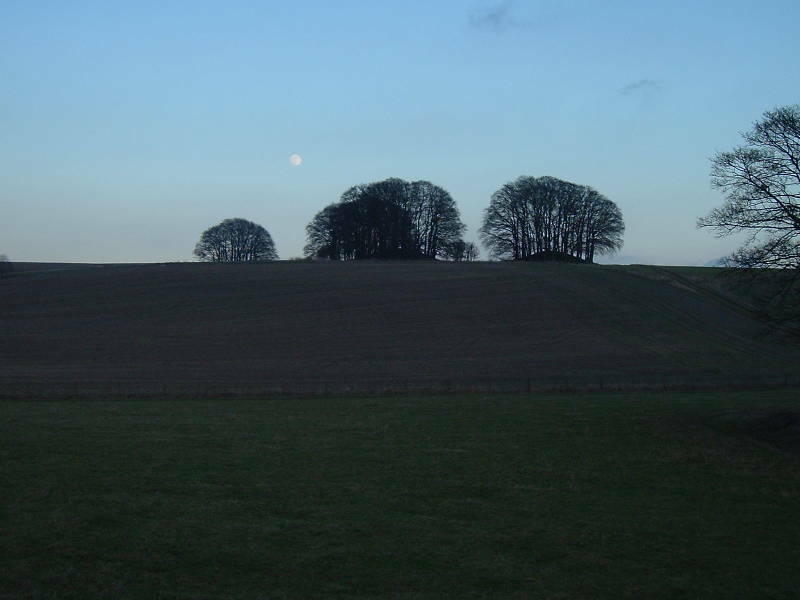 The full Moon rises over some tumuli on a ridge. Norse mythology gave rise to the concept of a warden tree, or vårdräd in modern Swedish. This came had evolved from the Old Norse concept of a vörðr, meaning "warden" or "watcher" or "caretaker". The vörðr is a spirit that follows the soul or hugr of each person from birth to death. Old Norse vörðr became Old Swedish varþer, leading to modern Swedish vård. Belief in the vörðr remain strong in Scandinavia until the 1700s and 1800s. Under the influence of Christianity, the belief changed to be more like the Christian concept of a good and bad conscience. As for the warden tree or vårdräd, this would be a very old tree growing on a farm, typically a linden, ash, or elm. It was believed to defend the farm and its family against bad fortune. It was a serious offense to break a leaf or twig from the warden tree, which was so respected that the family housing one could adopt a surname related to it, such as Linnæus like the family name of the great scientist, or Lindelius or Almén. 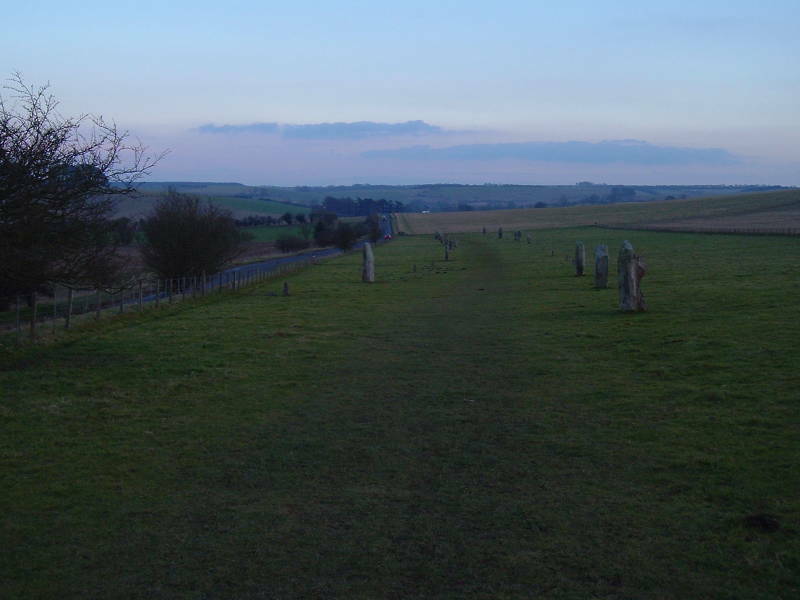 The West Kennet Avenue, or simply "The Avenue", leads off 2.5 kilometers to the south of the Avebury henge toward the Sanctuary. The B4003 road into Avebury was built parallel to it. The Avenue was originally lined by about 100 pairs of stones dating to about 2,200 BC based on Beaker style pottery found buried beneath some of them. Traces of the Beckhampton Avenue extend to the west from the Outer Circle. 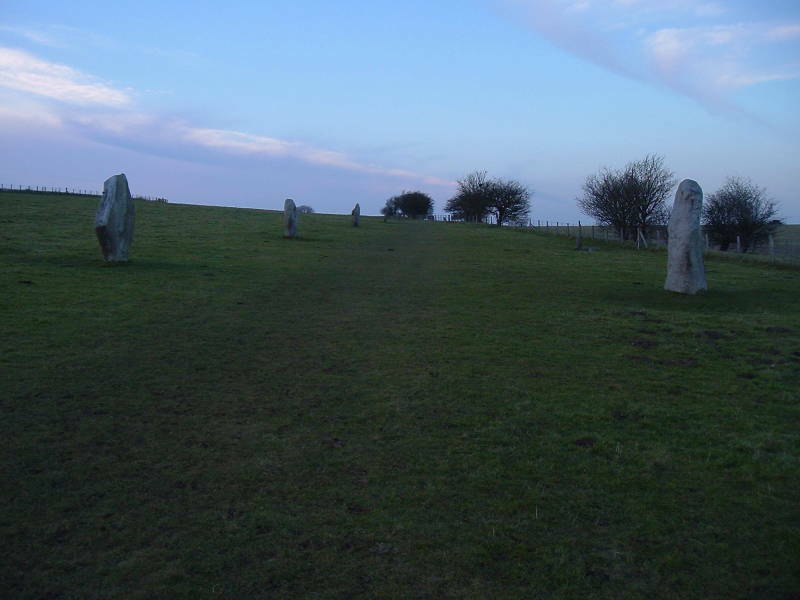 Continuing along The Avenue toward the Avebury henge, you climb a slight rise before you get to the stone circle. We turn around and look back down The Avenue from near the top of the rise. When we come over the rise we see the Avebury stone circle ahead. It's especially atmospheric if you happen to be there when a nearly full Moon rises around sunset. 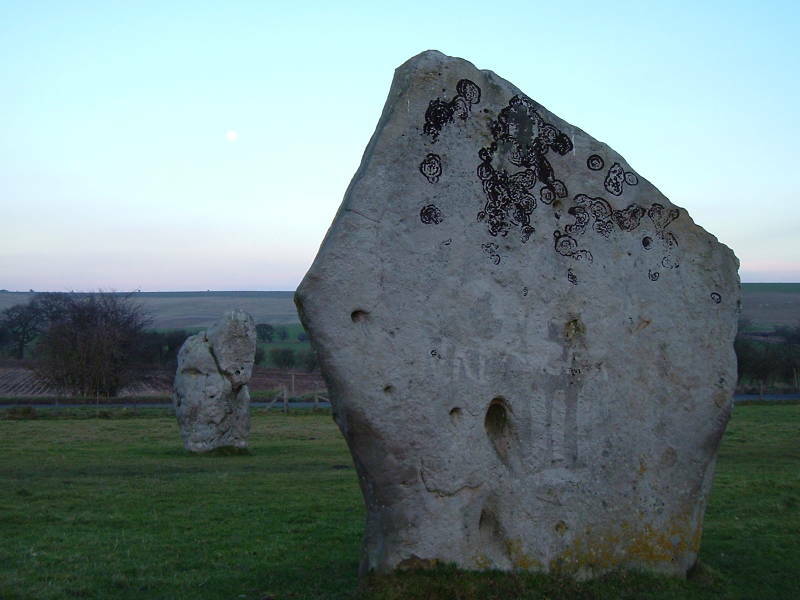 Ross Nichols, described as a "prominent modern Druid" and the founder of the Order of Bards, Ovates and Druids, believed that an astrological axis connected Avebury to Stonehenge. This theorized axis flanked on one side by the West Kennet Long Barrow and Silbury Hill. 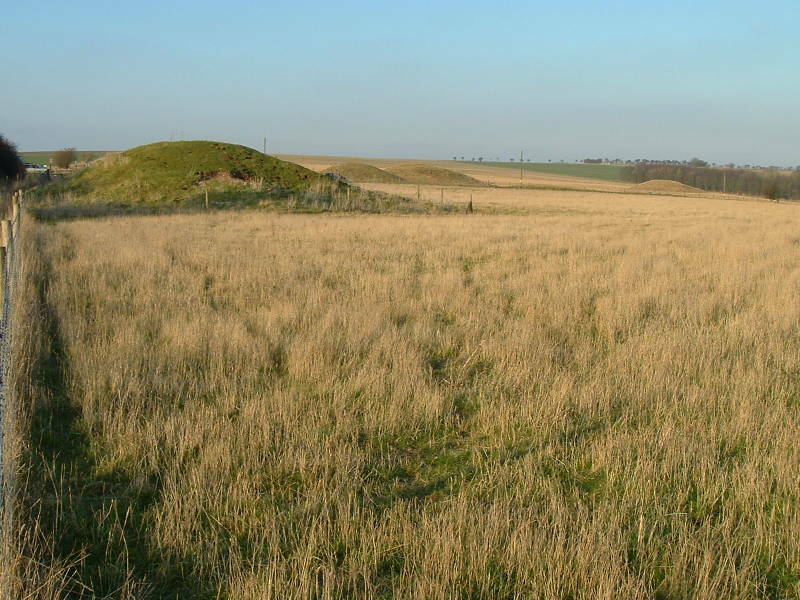 He saw the West Kennet Long Barrow as a symbol of the Mother Goddess, and Silbury Hill as a symbol of masculinity. The reality is that the Druids, of which we really know very little, didn't even appear until well into the Iron Age, some two thousand years after these monuments were built. Megalithic nonsense had been around at least since the 1800s. The Reverend R. Warner wrote The Pagan Altar in 1840, arguing that the Phoenicians had built both Avebury and Stonehenge. Many in the Victorian era believed that the sea-faring Phoenicians had brought civilization to Britain. The Phoenicians were awfully, well, foreign, and James Fergusson's Rude Stone Monuments in All Countries in 1872 explained that Avebury had been built in the Early Medieval period to commemorate the final battle of King Arthur's warriors, many of whom were obviously buried here. Phoenicians? Arthurian warriors? Nonsense! It was obviously those Native Americans from the Appalachian Mountains who crossed the Atlantic from North America to Britain back in prehistoric times just to build the great magalithic monuments of Britain. Or so W.S. Blacket explained it in his 1883 Researches into the Lost Histories of America.